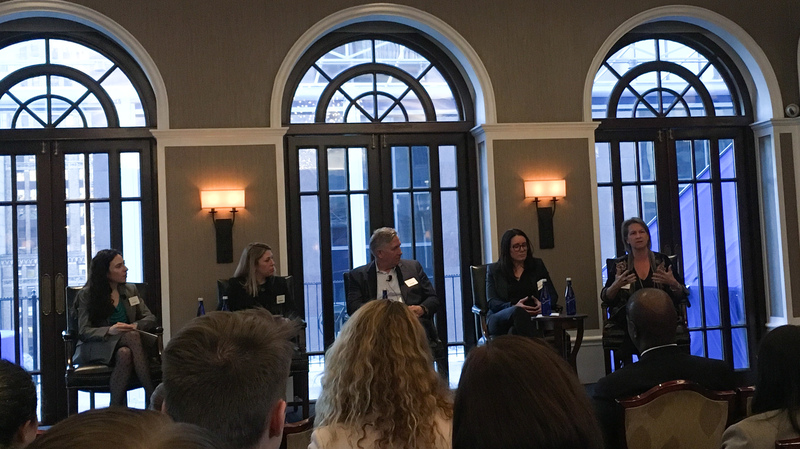 Staff from AmeriVet Securities attended JP Morgan’s panel “Exploring Financial Services Opportunities for Veteran Talent” at the Yale Club. The panel highlighted military veterans who have transitioned into careers in finance as well as seasoned financial veterans. Brandis DeSimone, a Naval Academy graduate and Senior Managing Director within Corporate Services Group at Nasdaq noted that “networking that you have today with companies like JP Morgan were not existent.” During the Q&A portion of the night, audience members asked about veteran training programs at the large financial institutions, which are a large part of their veteran recruitment efforts. Suni Harford, Head of Investments, Group Managing Director at UBS stated that “the training programs will get you exposed to all different types of fields.” The best piece of advice given for the night for transitioning veterans or veterans currently navigating their career in finance is to “find ten things you like to do and ten things you do really well and see where 3 of them overlap.” This should be the career you pursue. We thank JP Morgan and Mark Elliott, Head of Military and Veterans Affairs at JP Morgan for coordinating the event. Events like this are a unique opportunity for our veteran employees to get insights into the financial industry from seasoned professionals.